Hopefully this will only be of academic interest, not something you ever experience. I was over at the luthier's several months ago when someone called asking if he had a 1/2 size rental violin on hand to rent. He pulled an old case out, checked the violin and bow. The bow had most of the hair eaten off by a bow hair bug, so he'd have to rehair the bow before renting the outfit. He recently loaned me a luthier book, "A Luthier's Scrap Book", by H.S. Wake (published 1970, still in print), and I found a section on the bow hair bug that I found interesting. "In answer to a question regarding the little bug or insect that gets into violin shops and eats bow hair; it comes into the shop in old violin cases. Some customers bring their fiddles to the shop in the most broken down and dirty old cases together with a couple of bows with loose and broken hair all over the place. They also bring their cute little monster that eats the hair--the bow hair bug. I've seen this little rascal in action and once captured one alive and studied it under a magnifying glass. He's about the size of a pin head and appears to have a semi-hard shell, sort of egg shaped, and he closes up like a tortoise when you touch him. I found him in a child's fiddle case and he was buried in the hair at the tip of the bow. 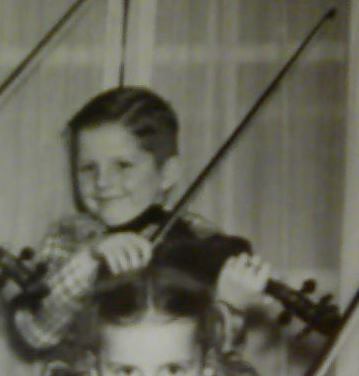 The child's mother said that the hair in the bow kept breaking and would I put in some GOOD hair. It appears that they only thrive in violin cases that are not kept clean, and whenever you open the case and see a lot of bow hair hanging loose you know that our little friend (ouch!) is in there somewhere. Now to get rid of him, take the case outdoors and brush it out well, especially in the corners, following up with a vacuum cleaner cleaning and leave the case out in the fresh air for several hours. A light spray with insecticide will finish the job on the case. Cut the old hair from the bow and keep an eye out for the bug--he's very likely there somewhere. Burn or bury the hair, don't just throw it in the wastebasket. Now when the bow is rehaired it should be fine and should last for quite awhile. The bug is very slow moving so you don't have to worry about him running away, if you're hunting for him. Note: Since writing this I have had an opportunity to examine the bow hair bug under a microscope and was very surprised at what I saw--the body of the insect is just one mass of long and short spines--almost an exact replica of a tiny porcupine." I have posted several time's on here about the "BowBug",, before you joined the forum, Steve. My luthier told me that they were similar to or are a carpet mite. I have had a few run-ins with the little critter's. They've eaten the hair off two of my bow's in the past. This is the reason I never keep my bow's in the case's, they hang on the wall between my violin's, as you can see in the pic above. They are pesky little devil's for sure. It's the dermestid beetle. They are the carpet beetle. Are also used in labs to strip flesh from bone. yuck! that just made me itchy!! Oliver had posted some article about bow hair bug/mite as well. I think if you rosin your bow hair enough, it will help keep the bugs/mites away. Basically rosin is a pine tree sap that will keep bugs away. off course keep your case clean. Tanners and taxidermists know them as hide beetles. They chew through hides that aren't stored properly. I had a bout with frozen shoulder and could not play my violin for five years. Yes, I was very depressed about it. Finally, I could play again, and I noticed that half the hair own my bow had been eaten through. I did not know about bow hair bugs. I knew my daughter liked to borrow my bow because I have a very nice one. I accused her of not loosening it when she put it in my case the last time. She swore that she always loosens it. When I went to the luthier, he told me about the bugs. He advised me to not leave my bows in the case, but to keep them in light because apparently the bugs only thrive in the dark. I haven't had a problem since. Now, all of my bows hang from the wall. You're exactly right, Duane, bow bug's love being in the dark. Did you opologize to your daughter ? My violin's and bow's never get in their case's, they hang on the wall from a violin/bow hanger I made last year. Oh, yes, I apologized to Joy a long time ago. I am hoping to get her on here sometime. I purchased a fiddle while living in SF quite a few years ago and took it out every now and then to experiment with it. At the time computers and the internet were not what they are today. I had no idea if there were Appalachian style fiddlers or if Old Time fiddlers were even present in SF. Now I know that they are...however, I purchased the fiddle and let it sit for about five years until I moved north into the Redwoods. One day I opened up the case and I sort of freaked out. The bow hairs were everywhere but where they should have been. It looked like someone had taken it to a barber and didn't finish the job. At the time I recall blaming it on my wonderful Siamese cat but I just did not understand how she could have gotten her sweet little paws in there to do the amount of damage that was present. So, no knowing, I purchased another bow. The exact same thing happened again. I was flabbergasted. How is that cat doing this?! This time I had the help of the internet and discovered that there was a bow mite or carpet mite doing the damage. So I purchased a brand new case (the other one was a goner anyway), vacuumed out the case, and cleaned and vacuumed over the bow and fiddle. I play (it's really practice the fiddle) everyday now and I haven't had a problem since. The old case I kept just in case but I vacuumed that as well and found the remains of the mites. They looked, without a scope or macro lens, like corkscrew shells left behind.